Okay- last week was hot- but this is ridiculous! The temperature has been triple digits (or just shy) for several days now. The plants are all drooping, the lawn is turning brown from the unrelenting sun and no one feels like moving outside. Even the pool feels warm. I keep reminding myself that back in February, as the blizzards blew, I prayed for summer warmth. Maybe I prayed a little too well?! But, now that we are here and hot, I am stuck wondering what I can make for dinner. This week my answer is: anything that doesn’t require heat! A few weeks ago when it was merely hot- as opposed to the current crazy hot- I found a recipe from Jean-Georges Vongrichten and Mark Bittman for Spicy Cold Cucumber Soup. It sounded particularly interesting because it was really a spiced cucumber juice- there was no chicken or vegetable stock in it-just pureed and strained cucumber. So, yesterday, with Harrison safely tucked away at summer camp, and Julia eating dinner at the snack bar at the pool, I figured it was now or never to give this cold soup a whirl. I grated and then pureed my cucumber, placed it in a strainer and pressed all the juice I could from the pulp. The result was a beautiful clear sea green liquid. Even if this did not taste good- it was pretty and cool to look at! I mixed in the rest of the ingredients and let the soup rest in the fridge for the afternoon. At dinner, I served the soup with a mound of crabmeat and diced mint. One bite and we were transported to far off lands. It was a fabulous blend of cool and spicy: tongue tingling but not too hot. And, for a day that broke heat records, this soup was the perfect foil. One note: This is great starter, side or lunch. I found it not quite filling enough for dinner. 1. Wash the cucumbers, but do not peel them. Cut off a piece and mince just enough to make one cup; set aside. Put the rest of the cucumber in a cuisinart, grate and then puree. Wring the resulting pulp in a cheesecloth or in a strainer set over a bowl. 3. 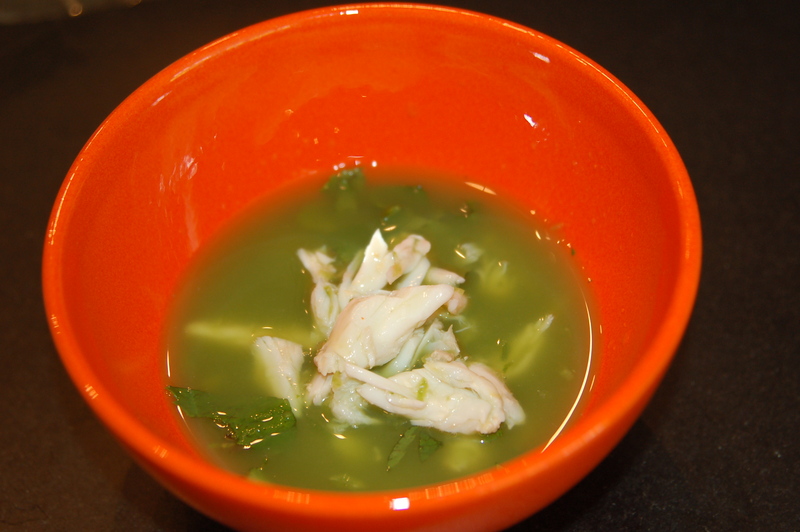 Taste the soup, adjust seasoning if necessary and serve, garnished with reserved cucumber, crab and mint. 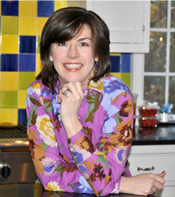 This entry was written by Caroline, posted on July 7, 2010 at 2:19 pm, filed under entertaining, light, lunch, seafood, soup, super speedy fast, vegetarian. Bookmark the permalink. Follow any comments here with the RSS feed for this post. Post a comment or leave a trackback: Trackback URL.